Baseball players and bubble gum are not typically a source of controversy. But that was before "Gumgate." San Diego Padres catcher Derek Norris accused San Francisco Giants outfielder Angel Pagan of intentionally tossing a piece of dirty old gum his way during the Padres' home opener Thursday evening. “If I tell you, you’re going to laugh,” Pagan warned reporters before explaining how the heated exchange unfolded in San Diego. According to CSN Bay Area’s Alex Pavlovic, during his ninth inning at-bat, Pagan accidentally threw a piece of gum under Norris’ legs while trying to remove the sticky substance from the batter’s box. Because, after all, who likes stepping in gum? Norris, apparently offended by the piece of old chewing gum, confronted Pagan, resulting in a warning from the home plate umpire. Instead of resorting to name-calling, Pagan fired back with a lead-off triple, hit deep to center field. Perhaps someone should remind Norris that there’s no crying in baseball, especially over gum. 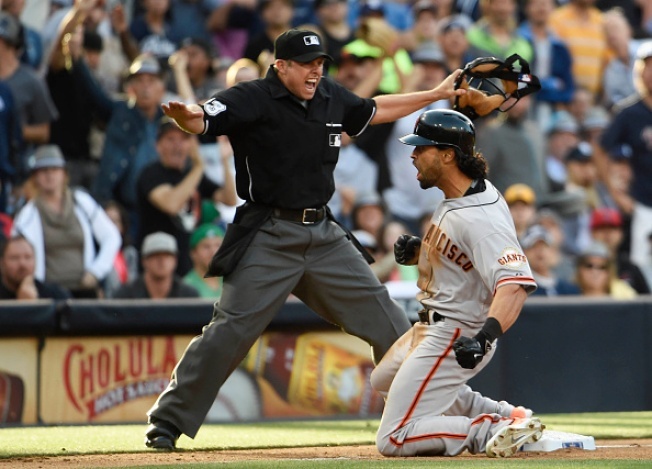 The Giants went on to defeat the Padres 1-0 in the 12th inning.